Home › Home and Kitchen › Dc Comics Robin Finger Puppet And Refrigerator Magnet - By The Unemployed Phi..
Dc Comics Robin Finger Puppet And Refrigerator Magnet - By The Unemployed Phi.. HISTORICAL AND ADORABLE - Each of our finger puppets bears the likeness of one historical, literary, political, or pop-culture figure. See the product description below for more info. A PUPPET AND A MAGNET - Our 4" tall polyester puppets double as delightful fridge magnets thanks to the magnet in their heads. We thought so already, but each one truly is a magnetic personality. EDUCATIONAL AND CHILD SAFE - Every puppet comes with a removable fold out tag that displays a portrait, a quote, and a brief summary of that character or historical figure's life and major contributions. They are child safe, and recommended for ages 4 and up. A PERFECT GIFT - For someone who has everything, why not a cute puppet of their most beloved personality. We have over 100 different puppets. Whether it's the Batman fan, or diehard Hannah Arendt enthusiast in your life, we have something for everyone. FROM THE UNEMPLOYED PHILOSOPHERS GUILD - Don't worry. We are employed, just not as philosophers. We're a small, Brooklyn based company specializing in gifts for the sophisticated gift giver. Robin can team up with Batman to fight crime as the "Dynamic Duo" or patrolyour fridge and locker. 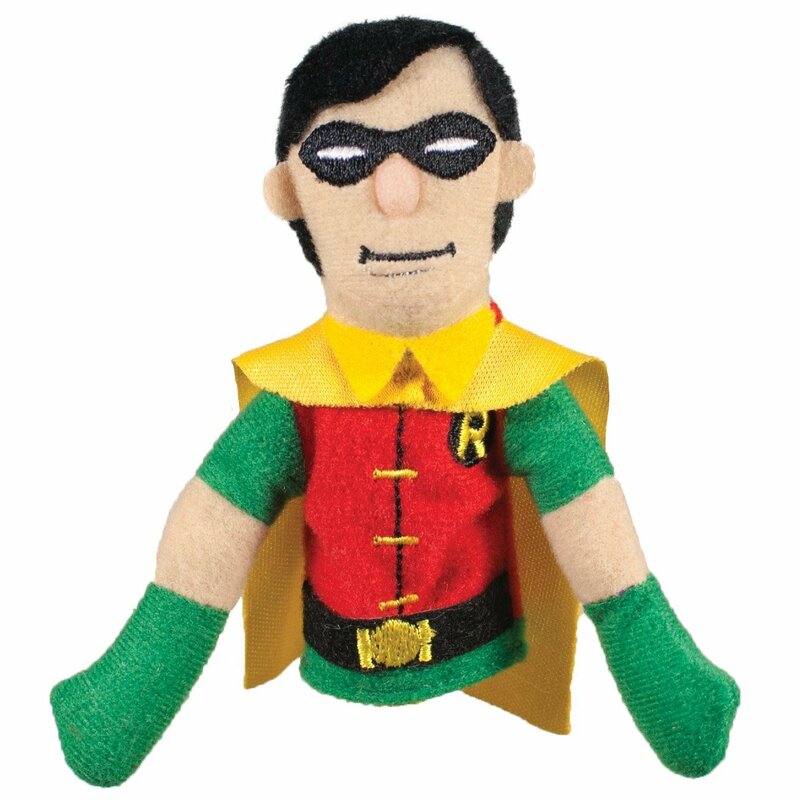 This puppet Boy Wonder is 4" tall and highly skilledin keeping your finger safe. Brought to You by The Unemployed Philosophers Guild The origins of the Unemployed Philosophers Guild are shrouded in mystery. Someaccounts trace the Guild's birth to Athens in the latter half of the 4thcentury BCE. Allegedly, several lesser philosophers grew weary of the endlessSocratic dialogue endemic in their trade and turned to crafting householdimplements and playthings. (Hence the assertions that Socrates quaffed hishemlock poison from a Guild-designed chalice, though vigorous debate surroundsthe question of whether it was a "disappearing" chalice.) Others argue that the UPG dates from the High Middle Ages, when thePhilosophers Guild entered the world of commerce by selling bawdy pamphlets topilgrims facing long lines for the restroom. Business boomed until 1211 whenPope Innocent III condemned the publications. Not surprisingly, this led toincreased sales, even as half our membership was burned at the stake. More recently, revisionist historians have pinpointed the birth of the Guildto the time it was still cool to live in New York City's Lower East Side. Twobrothers turned their inner creativity and love of paying rent towardsfulfilling the people's needs for finger puppets, warm slippers, coffee cups,and cracking up at stuff.